THE SEASON: The Prince George Cougars franchise is in their 25th season in the Western Hockey League. The Cougars record is 16-30-4-2 through 52 games this season. The Cougars sit fifth in the B.C. Division, eight points out of a playoff spot in the Western Conference and are 0-7-3-0 in their last 10 games. LAST GAME: The Cougars lost their 11th-straight Wednesday, losing a 4-3 to the Vancouver Giants in overtime at the CN Centre. Vladislav Mikhalchuk, Josh Maser and Reid Perepeluk scored for the Cougars, who erased a 3-0 second period deficit to force OT. Taylor Gauthier stopped 26 of 30 shots in the Cougars’ crease. The Cougars are 1-6-1-0 in eight games against the Giants this season. COACHING CHANGE: Thursday, the Cougars announced they relieved Richard Matvichuk of his head coaching duties. General Manager Mark Lamb assumes the role as head coach on an interim basis. Director of Player Development, Nick Drazenovic, has been promoted as an Assistant Coach and will join Mark Lamb and Associate Coach Steve O’Rourke on the Cougars’ bench. In three seasons behind the Cougars’ bench, Matvichuk compiled an 85-89-12-10 record, guiding the team to a B.C. Division pennant and a franchise-best 45-wins in the 2016-17 season. NUMBERS: Vladislav Mikhalchuk (4-2-6) has six points in his five-game point streak. He joined the 20-goal club for the first time in his career, with his second period goal Wednesday. He has 10 points (4-6-10) in eight games against Kelowna. Ryan Schoettler has four points (0-4-4-) in his last five games. GAUTHIER, MOBERG RANKED: Taylor Gauthier and Cole Moberg were both listed in NHL Central Scouting’s midterm rankings. Gauthier is ranked fifth among Northern American Goaltenders and Moberg is 175thamong Northern American Skaters. The pair are among 48 WHL players listed in the midterm rankings. LINE UP: The Cougars are still missing defenceman Joel Lakusta (upper-body), forward Ilijah Colina (personal) and goaltender Isaiah DiLaura (upper-body). 15-year-old prospect Tyler Brennan will continue to serve as Taylor Gauthier’s back up. 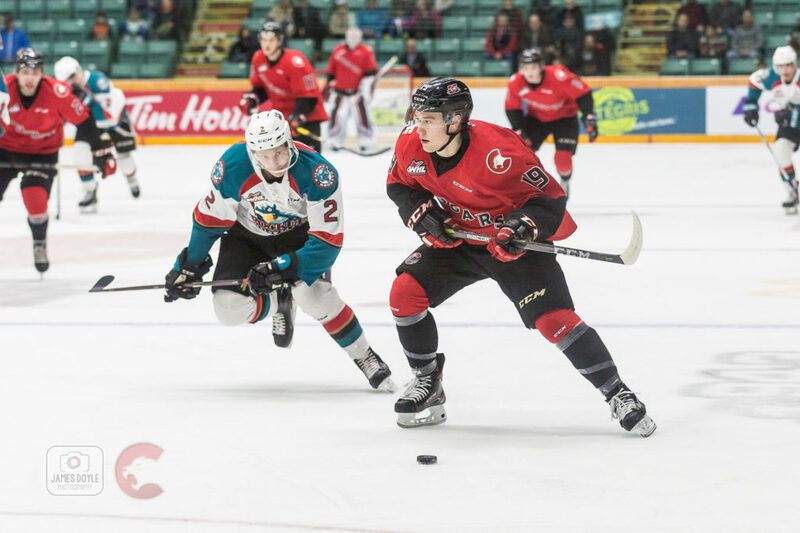 Kelowna forward Conner Bruggen-Cate is serving the second game of a two-game suspension, stemming from an incident against the Kamloops Blazers last week. Forwards Ted Brennan (upper-body) and Liam Kindree (upper-body) are listed on the WHL weekly injury report; both are listed as day-to-day.